Today, I just wanted to share a couple of exciting things that have happened in the last month for me. First, as many of you know, I got to go to the Lion Brand Blogger Bash in New York City! It was so incredible and below you’ll find several photos from that trip. Thank you SO much to the team at Lion Brand for what was a trip I’ll always remember. 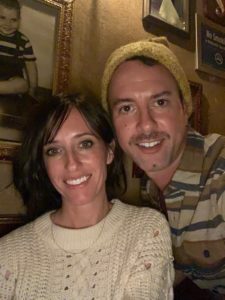 I was also recently interviewed with Brittany from B.Hooked’s podcast! You can see the show notes and listen here (we talk about making easy yet pretty pieces) and I’ll chat a more about in a bit! First, I’d like to share some photos from my trip to the big apple. Above: One super fun part of this trip was the time we had to shop at the Lion Brand Yarn Outlet in New Jersey. I eyed these skeins of Anya and ended up getting a bright color mix to make a hat for my daughter. There were some bins with really great deals on yarn and you can find every Lion Brand Yarn imaginable in that store. I even saw some of the discontinued yarns available. There were six of us this year at the Lion Brand Blogger Bash and we missed Jess from Make & Do Crew as she was about to have her baby. 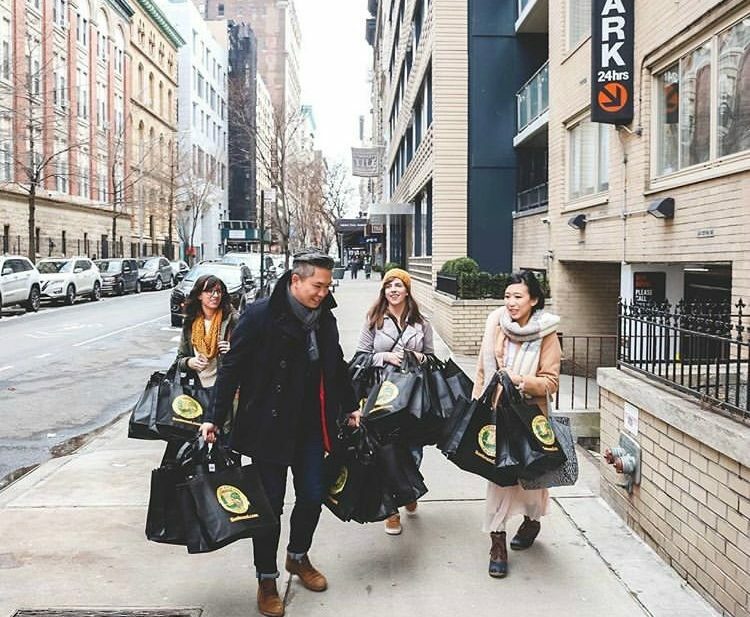 We made our way to New York city to meet with the Lion Brand team as well as talk all things yarn! 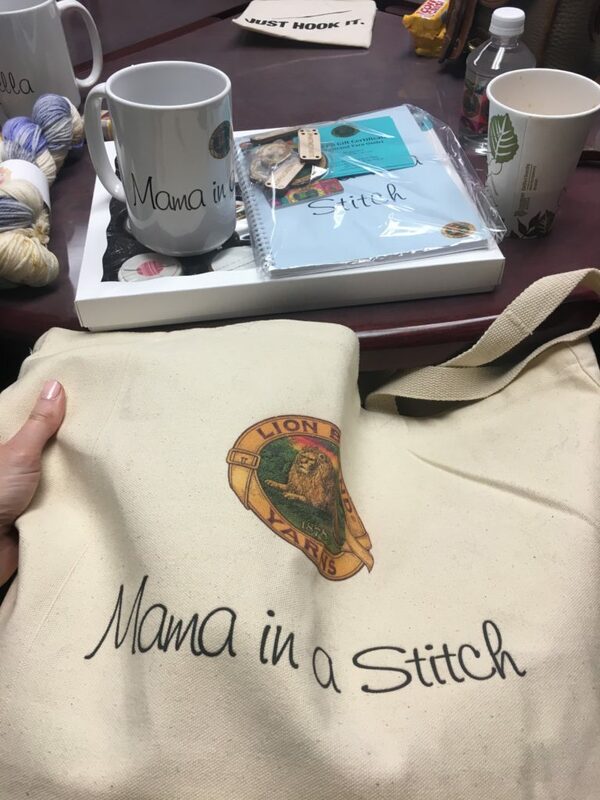 It was an incredible time and what really strikes me is how the knitting and crochet community can come together and enjoy one another like we did. Who knew a group of people could talk endlessly about string! Hehe! We also genuinely enjoyed one another’s company and friendships. 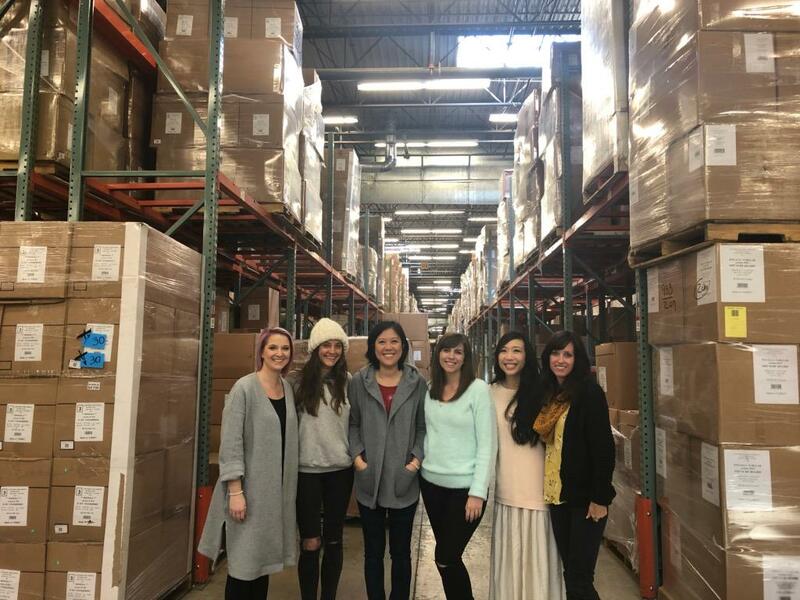 Above: We were even able to tour the warehouse in New Jersey! These boxes are all full of yarn that will eventually make their way into our hot little hands. 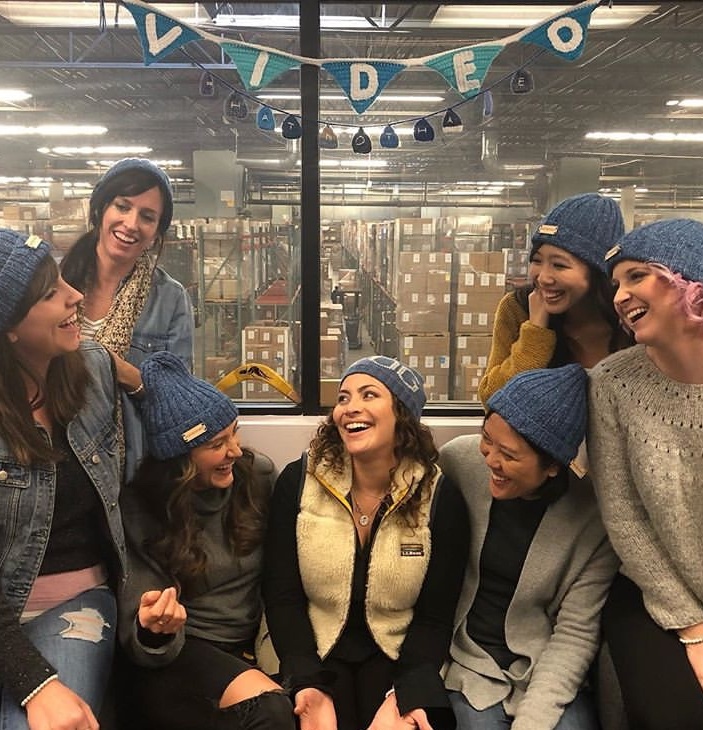 Pictured here is Chantal from Knitatude, Alexi from Two of Wands, ChiWei from One Dog Woof, Ashleigh from Sewrella, Stephanie from All About Ami and me! You might remember that I also got to attend this amazing event last year, and I wrote a blog post about that experience as well (here). I wasn’t as nervous as last year to go to the event since I’ve made friendships with these girls and the Lion Brand team. However, I’m used to crocheting and hanging out behind my computer most days while Emilia’s at school, so I still had some jitters! Of course, once I was there, it was nothing but an incredible time! It was absolutely awesome to be together in New York City. I’m sharing a few pics here, but you can also read an in depth article about the trip from Stephanie (love her, by the way), from All About Ami, HERE. She does a great job of remembering all the details and happenings of her time and our events in New York. Above: Each of the bloggers received a lot of fun swag from Lion Brand! They made us feel so special and we all felt so grateful to be a part of it. We also got to meet Shira and even interview with her! You know her from Tea With Shira and she’s running the anti-bullying campaign #HatNotHate as well. Here we are in blue hats! If you’d like to make a hat, they are hoping to collect 25,000 hats to donate to schools (read about it here)! Above: An added bonus was that I got to see my brother who lives in Brooklyn! We had a great Italian Dinner at Lil Frankies. And last but not least, as I mentioned earlier, I was interviewed on Brittany from B hooked’s podcast a few weeks ago! I was actually quite nervous as I’ve never done anything like it. I don’t feel like I’m an expert on anything really as I just make things and share them with you! Lol! But what an honor it was to be able to chat with her. We talked about making pieces that might seem difficult and how to tackle them without being intimidated. 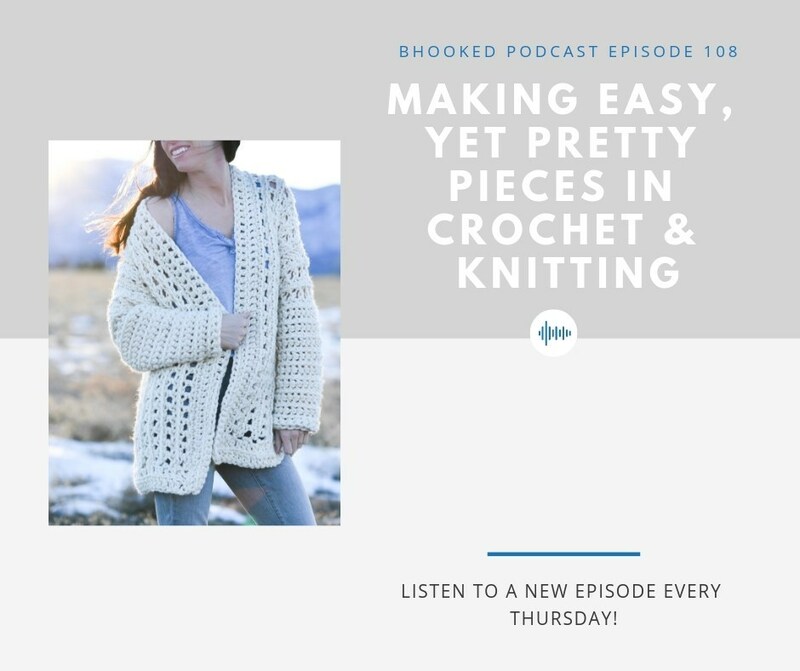 We also talked about how to make easy but pretty crocheted sweaters and wearables. This is something I’m passionate about as my entire blog essentially focuses on simple but pretty – it’s what I love! You can see the show notes here and have a listen. And if you haven’t already, definitely check out Brittany’s YouTube Channel (here) she’s amazing with video and has so many helpful tutorials. You can also find her website here. The B.Hooked Podcast is also available on Stitcher, iTunes, Google Play and TuneIn. It’s been quite an exciting month for me, and I can’t thank you each of you enough for your continued inspiration! Nothing but gratitude over here. Your first Podcast interview?! I would never have known as your love of craft and personality came across magnificently. Brittany from B.Hooked’s podcast certainly did her homework. 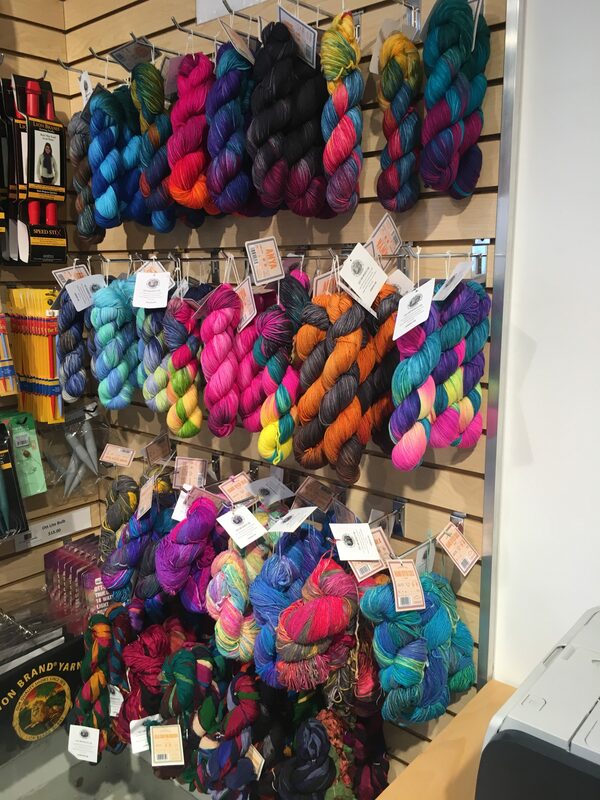 Yarn crafters – what a great tribe to be a member of!! That’s so sweet, Carol! Thanks for making me feel good about the interview – haha! It was an honor for sure and I’m so glad you enjoyed it. And we were definitely happy in those photos – no responsibilities but to laugh and talk about yarn. Have a great day and thanks again Carol! What a fantastic opportunity for you! Thanks for sharing your experience in New York. I love your blog and patterns. Keep up the hard work. Wow! Ok, envy is a bad feeling. However I feel better because you so totally deserve this experience. Thank you for letting us go with you to New York.